Tropical sage in the herb garden by the kitchen window. 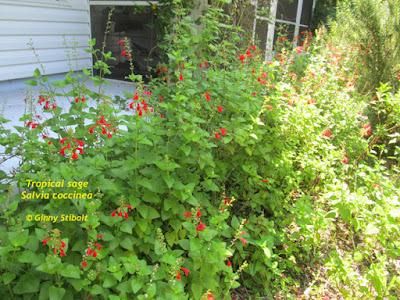 Tropical sage (Salvia coccinea) has monopolized much of my herb garden. I transplant some of it from this location when I plant basil, dill, or one of the other annual herbs, but mostly I leave this native volunteer in place because it attracts hummingbirds, butterflies, several types of bees. I started the herb garden years ago by ripping out the tea roses and various non-native shrubs that were not doing well in this WSW-facing wall. At first everything was in its assigned place, but when the sage arrived, everything changed. I listened to the birds and the bees who needed this beautiful native more than I needed a neat garden. 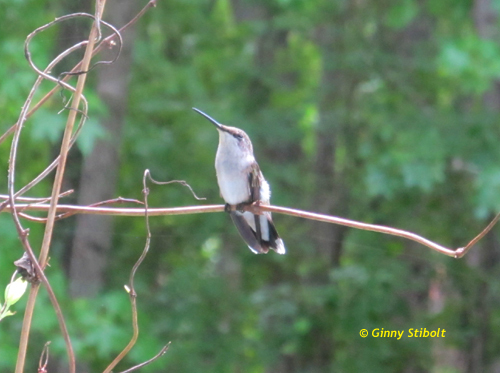 This female hummingbird has been resting on a bare branch of coral honeysuckle to entertain my husband and me while we eat our lunch. Not really, but this perch is just above one of her favorite spots, my herb garden, which is filled with tropical sage. 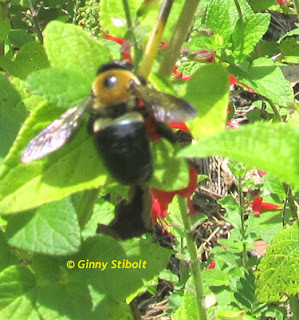 Carpenter bees are too big to enter the narrow sage flowers, so they bite holes in the tops of the flowers to "rob" the nectar without doing the work of pollinating. I turned it into a container garden. 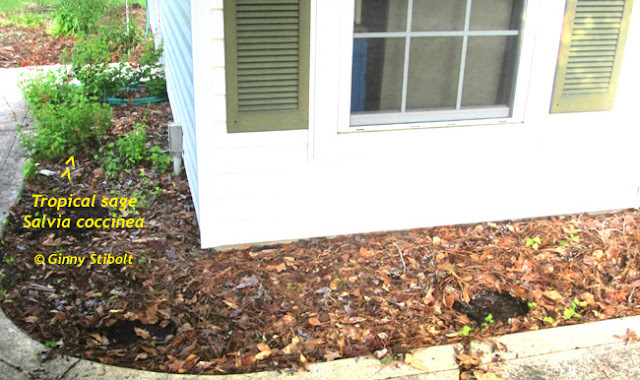 An early project in our landscape was my conversion of a "messy bed" filled with Mexican petunias, low growing gardenias, weeds, and other volunteers. 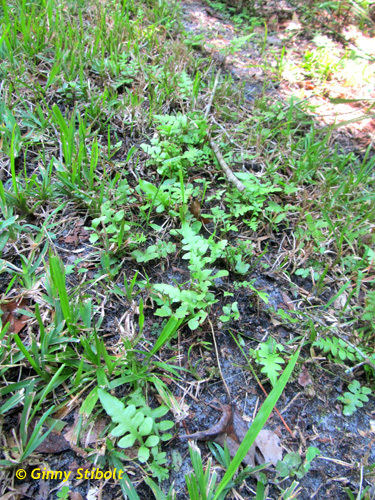 I wrote about this project as one of my Adventures of a Transplanted Gardener articles, which are now hosted over on Floridata.com, Troublesome spot? Convert to containers. Well, it's taken a while, but the other day I switched back to what will probably be a somewhat messy bed, but this time it will be filled with native wildflowers and I shall call it a "cottage garden." After removing the pots, I was left with weeds and wildflowers. 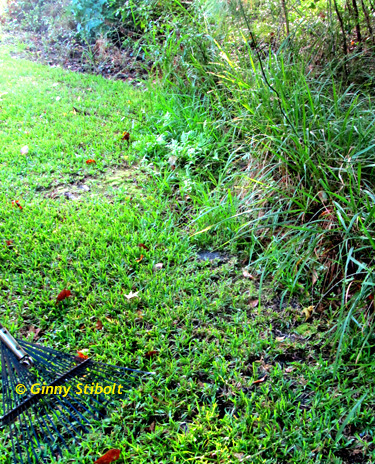 The other day I removed the pots, which were not all that attractive anymore, carefully lifted the tropical sage plants, scraped out the chipped wood mulch and the nice compost below it, and then ripped out the old weed barrier cloth, which had not been very effective in keeping out the weeds. I put the saved chips and mulch back in the bed, planted the sage in three groupings, transplanted some other out-of-place wildflowers from other parts of the yard, and then sowed some Florida wildflower seeds in the empty spaces. The tropical sage and the other plants survived the transplant, but I'll write more about this project as it matures. So far I'm happy with the result and I think, in the end, it will be easier to handle than the containers. 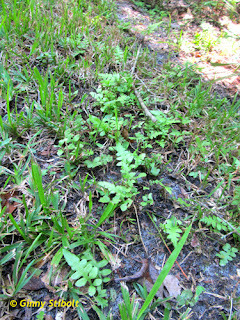 Florida wildflower seeds have been sown and the wildflowers are now replanted in groupings. It's a garden designed by listening to what it said rather than overpowering it with my will. A look down this edge now. Every couple of years I work on the lawn edges. Many times the landscape indicates what it would prefer. 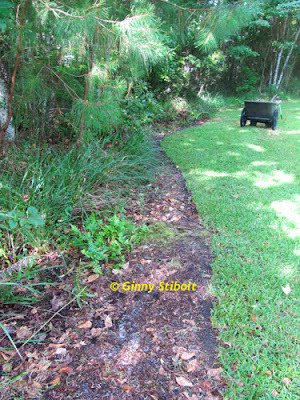 I've been writing about edges for some time; see my piece "Cutting edges," for earlier lawn removals. You can also listen to my podcast on the topic: Cutting Edges 1/17/08. 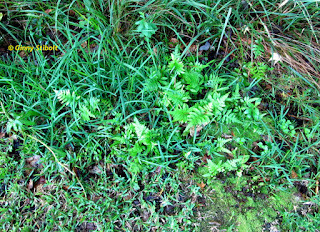 This time around, the ferns, mostly netted chain ferns (Woodwardia areolata) have crept into the grass, which is sparse in this mostly shady edge. So I pulled the grass by hand in a way that was least disruptive to the soil, moss and the ferns. Later I'll come in with some pine needles or wood chips. If it were closer to fall, I'd wait for the leaves, but I don't want to wait that long. We still want a mowed area down to the lake, but maybe my husband will have one less trip to make. All because I listened to the ferns. The point-of-view of this photo starts at the cart in the above photo. 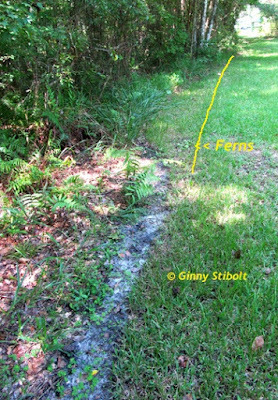 The line drawn indicates the proposed new edge of the lawn. 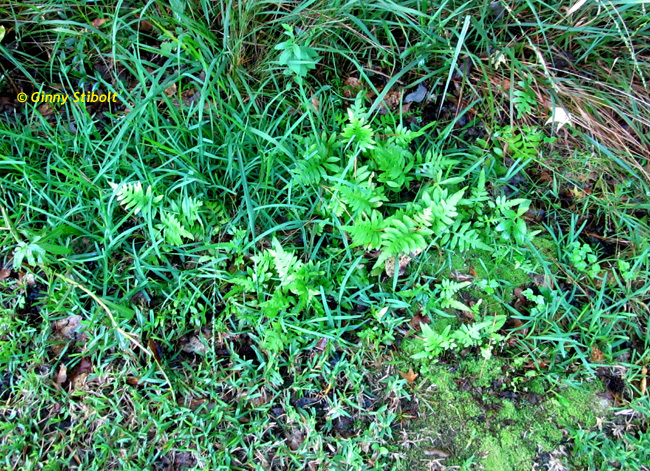 More ferns are invading the grass down here, too. 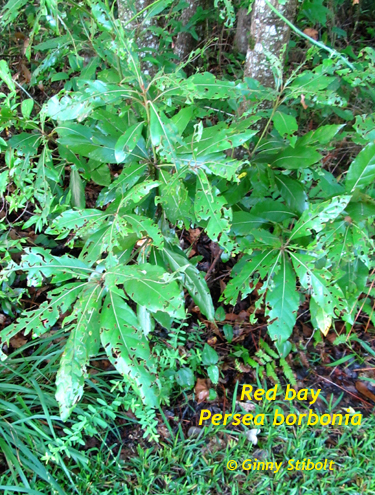 Sadly, these suckers will never grow into trees because of the red bay ambrosia beetle and its nasty fungal disease. My husband thought we should trim them back since they are so ratty looking. I pointed out that the spice bush swallowtail and other related butterflies rely on trees in this family for their larval food. So all those holes in the leaves means that they have found them. Yay! I wrote about this new wildflower extension of our front meadow in Adventures in creating a native garden. 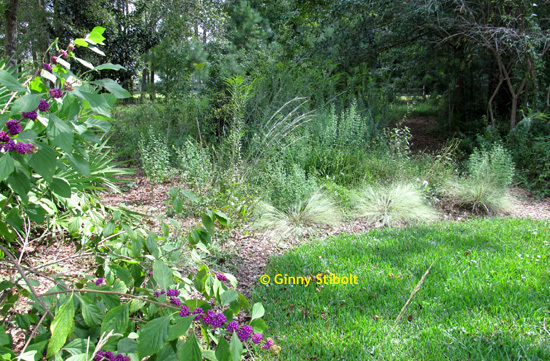 I emphasized how important a civilized edge is to make a native garden or meadow look like a planned space. 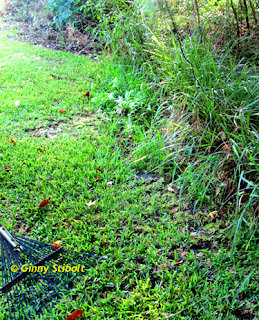 I used three bunches of Elliot's love grass (Eragrostis elliottii) to do that job. They looked good for 2 years and then failed to come up the next year. I talked to the grower and wholesale supplier for these plants to ask him what to do. His answer was the classic "listen to your landscape" advice, "Don't plant it there again. Find something else." How logical. I hope you can hear your landscape when it speaks to you.